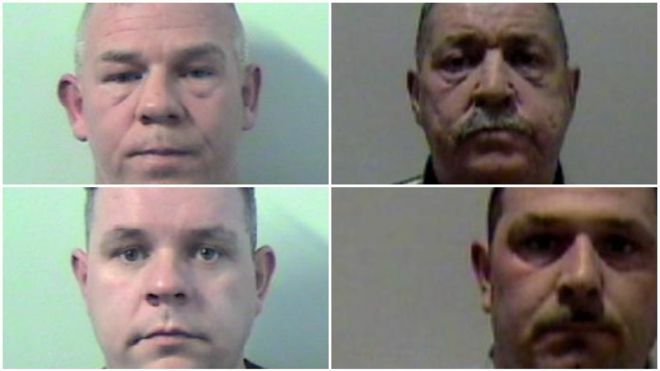 At a trial in Glasgow 3 men, from a Gypsy Traveller family, have been found guilty of abduction, violence and intimidation against men who they made work for them. Robert McPhee and his son-in-law John Miller and James Mcphee were convicted for the crime of servitude - holding men against their will and forcing them to work for little or no money. The men were found guilty of over 20 charges spanning the years 1992 to 2016. The five-week trial heard they preyed on 8 men from highly vulnerable backgrounds. The men were offered paid work doing jobs such as mono-blocking driveways but were held captive and made to do up to 16 hour shifts for little or no pay. They were brutally beaten if they complained or tried to get away. One tortured victim told how he was beaten up and "taught a lesson" when he tried to escape. Another lived in a caravan with no running water or toilet and was told he was the property of the family. Jurors heard further evidence of a worker "left cowering like a dog" due to the abuse. The gang denied all the charges claiming they were picked on by "overzealous" police. They argued they had shown "kindness, generosity and tolerance" to workers. In a rare instance of tough sentencing the gang have been jailed for a total of 29 years. Read: "Secret tapes revealed showing UK Civil Servants plotting against Brexit!" Read: "Warning to pensioners over this disgusting phone scam"